I'm following my best friend up the Mount Whitney trail on a beautiful day. Who wouldn't be happy? When my oldest friend Tim invited me to California to hike Mount Whitney, I swelled with excitement for the opportunity to summit the highest mountain in the continental US. I hoped that I could write a nice article about my experience on the mountain. It’s early in the season, and the Sierras witnessed more snowfall than they have in years, meaning there’s still lots of snow and ice. When Tim said we would likely need crampons to make the trek, I grew nervous, but also more excited. I had never used crampons before and though that brought a little anxiety, trying new things is the exactly what I do and write about. “Bring it on!” I thought. Nerves be damned, I planned on wearing those crampons all the way to the summit if necessary. I often say things never go exactly as planned. In many ways this trip epitomizes that, as you’ll eventually see. Originally, I planned to write a “How to Summit Mount Whitney” article. That’s not what you’re reading, however. This is a much different journey. It’s long, especially considering we only explored the mountain for two days. I have a lot to say about those two days though, so I’m serializing this narrative. Today I’m publishing the Prologue and Part One and I will post an additional chapter every day for the next four days. That may seem like a lot of material broken up over several days but I think once you’re reading this story, you’ll understand the need to separate it into chapters, as well as the need to publish all the parts in quick succession. This is an emotional tale at times; it brought a tear to my eye several times as I wrote it. Which seems strange when you consider how much I enjoyed myself on this trip. But as you’ll come to find out, this isn’t just a story about me. We hiked straight into tragedy and sadness on Mount Whitney, but I’m going to try to take something positive out of it. To share some lessons that might help others. Most of all, I’m going to try my damnedest to do these stories justice. That’s what the ranger told us as we picked up our permit to hike Mount Whitney. Despite initially having a team of 10, we had dwindled to just Tim, Jon, and myself. I didn’t know Jon, but I liked him right away. “You sound like the internet,” he told me laughingly in response to some meme or joke I quoted during the car ride. Our senses of humor, while different, aligned rather well; we had plenty of laughs along the way. Which is, in my opinion, the best way to start an adventure as well as a friendship. Tim and I had more camping experience than Jon, but we all shared the same complete and utter lack of experience with crampons and ice axes. Still, our excitement was palpable. We felt eager to start up the mountain, so we double checked the day’s weather forecast and kicked up the dust as we drove out of the lot. “Tell her it’s for your safety,” the salesman interjected. I honestly thought I wouldn’t need it, but I’ve had enough close calls to know that safety equipment is like a condom; it’s better to have it and not need it than to need it and not have it. Slightly more educated on how to put on and walk in crampons, we loaded back into the jeep and headed down Whitney Portal Road. White puffy clouds lazily drifted across an expansive blue sky. It was hot, but not unbearable. The Sierra mountain range looked beautiful before our eyes, and we were all excited. 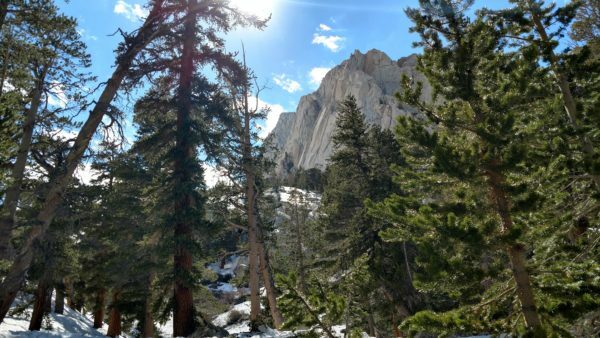 We wasted no time unloading, stowing excess food in the bear locker, strapping our packs onto our backs, and heading to the start of Mount Whitney Trail. We felt free. 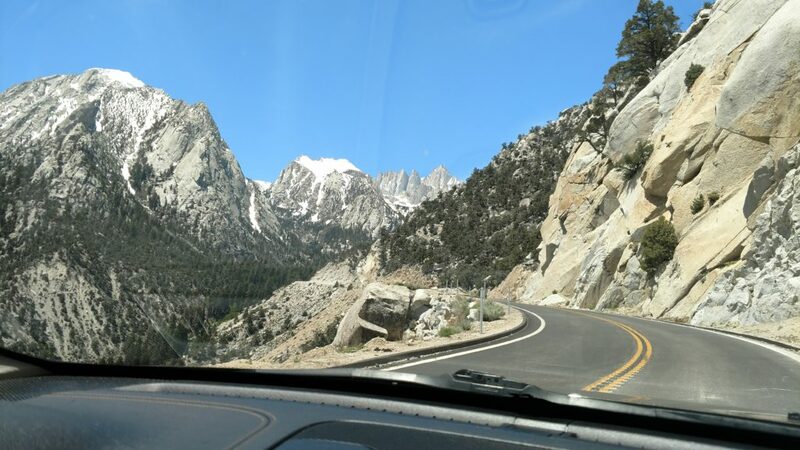 On the Road to Mount Whitney. We, of course, told him that we would and took a long hard look at the flier before proceeding on our way. Later, Tim, Jon, and myself would all agree that this made us feel uneasy. 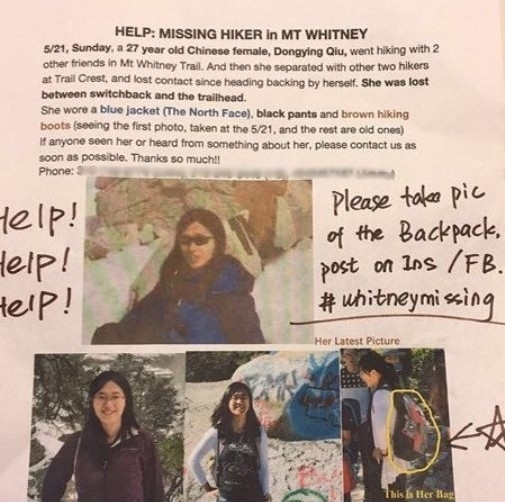 Not worried that something would happen to us, not belief that we might find this hiker, but simply some slight discomfort that we couldn’t put our finger on. Still, the mountain awaited us, and I quickly snapped a photo of us with the trail sign and were on our way. 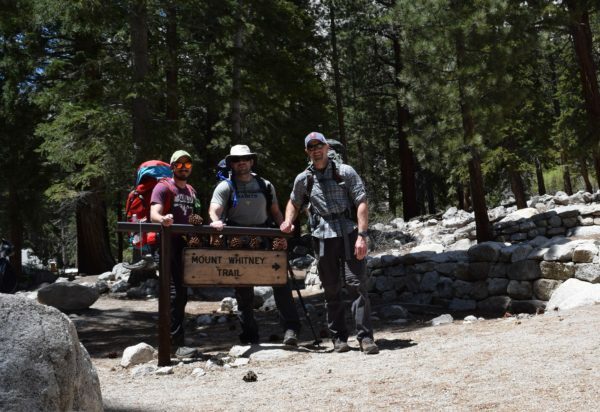 Myself, Jon, and Tim about to head up Mount Whitney Trail. It sounds like a cruel thing to say, and I suppose it is. Was it a joke? Not exactly, but my dark sense of humor was at play there. That very sense of humor is a survival trait, a mechanism that makes both potential threats and and tragedies manageable, according to Laurence Gonzales. In his book, Deep Survival: Who Lives, Who Dies, and Why, Gonzales explains that laughter dampens fear and promotes the balance between emotion and reason. Survivors use laughter in the most awful and tragic of situations, as do elite performers like fighter pilots, search and rescue teams, Army Rangers, and ER surgeons; it’s how they keep their cool. I can’t claim to be an elite performer, but I do use laughter in a similar way. It was my dark sense of humor that got me through my father’s death, and through neurological issues that left me painfully bed-ridden for months worried that I might die in my twenties. Humor has helped me walk away from fights, deal with getting lost, and steadied me while administering first aid. My dark sense of humor helped me manage those stresses; it’s a survival mechanism. So it’s no surprise that I would use it while thinking of a situation in which I could potentially find myself. Returning to work a week after that visit to the Badlands, I pulled up my RSS feed of outdoor related news and discovered that I had indeed been correct. Search and Rescue found the lost hiker in the area I referenced, and knowing that filled me with an odd feeling; not guilt, but a sadness at the loss of a member of the hiker community. I won’t pretend that my sense of humor became pure as the driven snow – it’s a survival mechanism, after all – but I don’t make such flippant comments anymore. 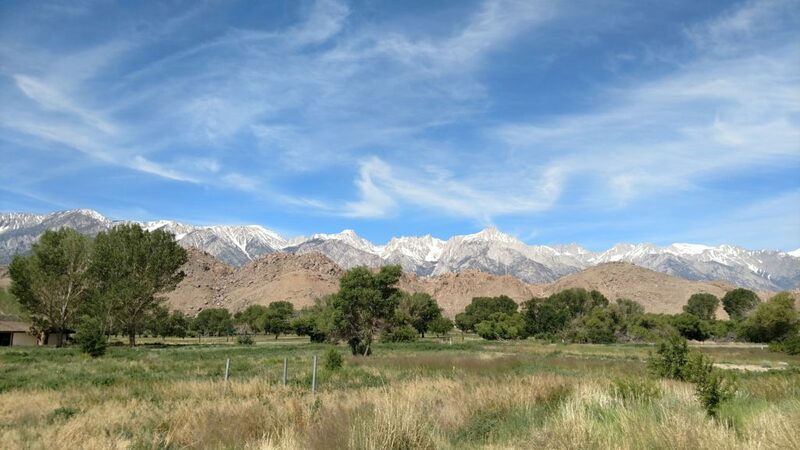 These thoughts entered my mind as we covered the first mile of the Mount Whitney Trail. In the beauty of the mountains, as sweat beaded on my face, such reflections quickly dissolved. Before long, the Sierras immersed me in their grandeur. I trooped along, quite happy to be on the mountain. I’m following my best friend up the Mount Whitney trail on a beautiful day. Who wouldn’t be happy? Our little crew made good time as we followed the trail upward, clearing our first stream crossing without issue. We stopped and waited for a friendly group of hikers we had previously spoken with; they moved more slowly than us, but we wanted to make sure they crossed the stream safely. Adventure is, after all, a community. After the stream crossing I saw the first small deposit of snow, tucked into the shade. I stepped off the trail and out of the sun and felt the cool air around the snow. It was a delightful reprieve from the heat, and I was grateful that I could see more of it as I gazed up the mountainside. Still, most of our footsteps continued falling on dirt and stone, so I thought little of the snow as we started walking again, soon crossing into the John Muir Wilderness. 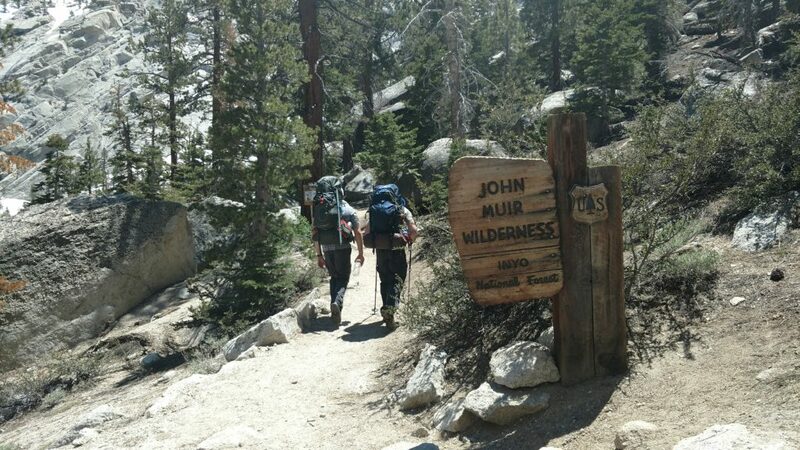 Tim and Jon leading the way into the John Muir Wilderness. The amount of snow on the trail continued to grow the farther and higher we went though. Worse than the slipperiness, it obfuscated the trail. We simply couldn’t keep track of it! Very few markers indicate where the path goes, and normally you wouldn’t need them. 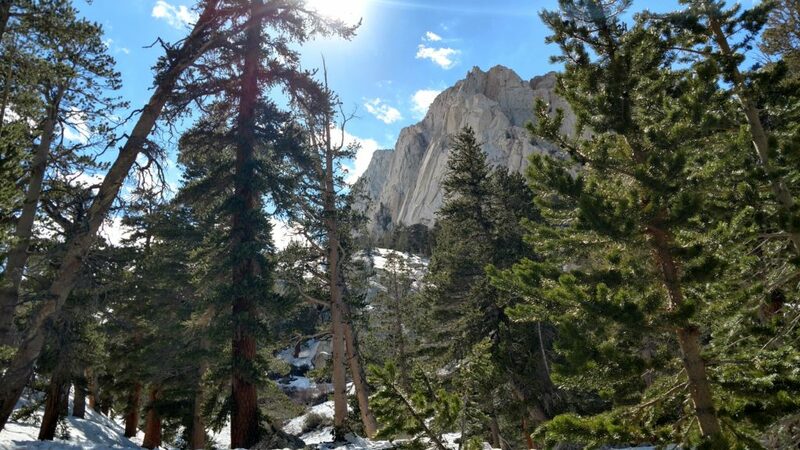 But Mount Whitney hasn’t seen this much snow in years, which left the trail largely unidentifiable in several places. Eventually the snow covered the trail. I’m pretty sure we were still on it at this point. One might think we could track footprints in the snow, but this low on the mountain plenty of day hikers had traipsed all over the place. Footprints led everywhere, half melted, re-frozen, coming and going. We consulted the physical map, as well as an app that Tim had on his phone called Go Ranger. We tried to make the two correspond to what we saw around us, but we struggled to do so. We’d head off one direction, only to go off trail. We’d head the other direction, and lose the way again. Then Tim took a step forward and without warning crashed to the ground. He had stepped from a spot of snow covered earth to a spot of snow covered granite, and his feet simply slid right out from under him. It looked awful, but thankfully wasn’t as bad as it initially appeared. He bruised some muscle around his knee, but the joint remained uninjured. I had thought that he had landed on his ice axe as he fell but luckily he hadn’t. After a few moments of recovery he started trying to try to find our path again, and I breathed a sigh of relief. 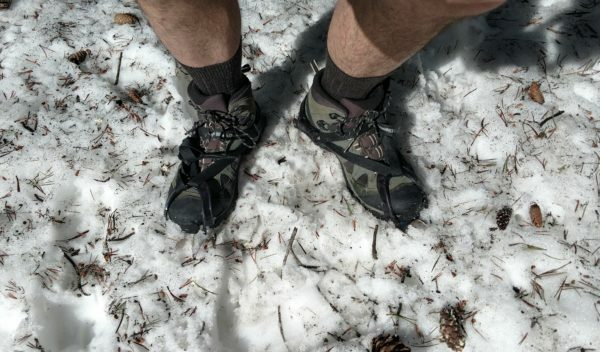 After more slipping and sliding on crusted snow, Tim remarked, “Fellas, I think this is what crampons are for.” Of course, the crampons! How the hell did I forget about them? Sitting on a log and retrieving them from my pack, I strapped them to my boots then wiggled my feet around. They felt surprisingly lighter than I had expected, and I took a few test steps in the snow. I felt good, secure, much more stable. I was excited to really put them to the test, since I had no previous experience with them. The remnants of worry about Tim’s fall faded as he took a few sure-footed steps and seemed ready to lead our party again. My first time wearing crampons. They took a little getting used to, but sure beat sliding all over the place! 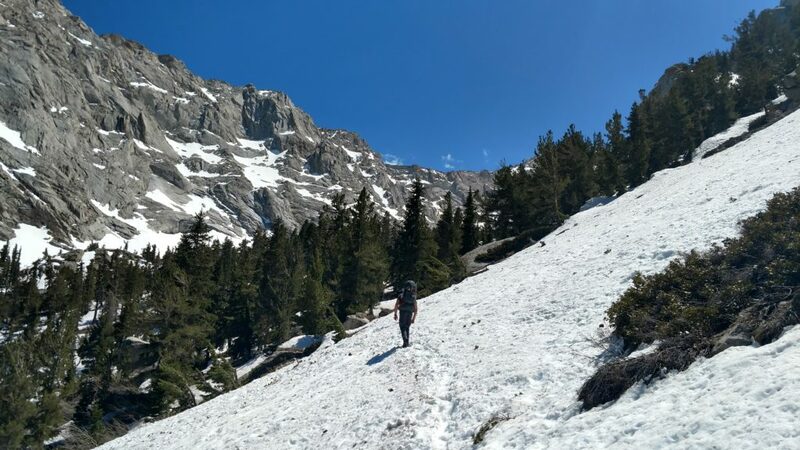 As we adjusted and tweaked the fit of the crampons on our boots, a party of five, appearing to have camped higher up the mountain, passed us coming down 100 feet to my left. 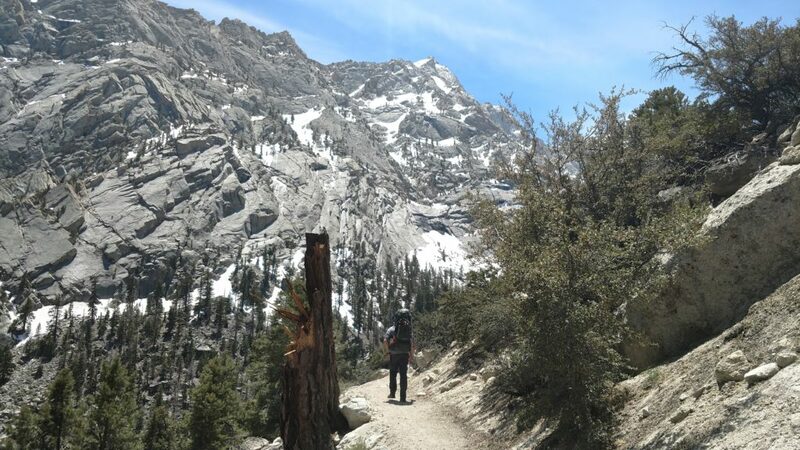 We had found the trail once again but we would continue struggling to stay on the correct path up Mount Whitney. At that moment, however, I still felt comfortable and confident, believing that by the same time the next day I would be descending from the summit. Clearly I underestimated what awaited us. Now you’ve got me wondering. I look forward to the next well written instalment. Thanks! I’m happy to hear that you’re enjoying reading them! Crampons! I love them! Ha, or Micro-Spikes are really the ones I’ve used. 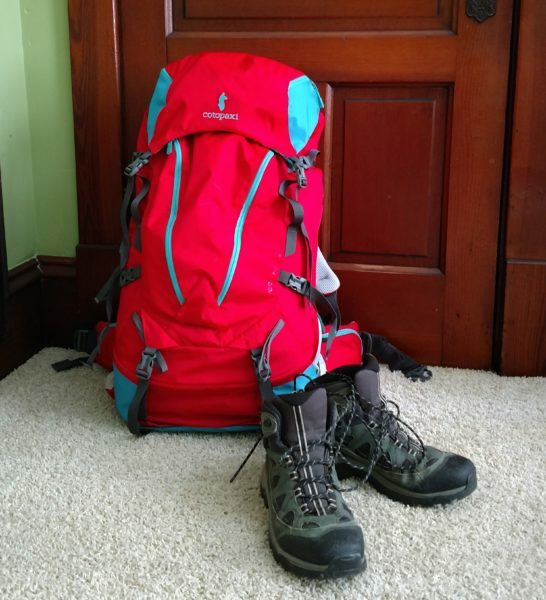 My friends and I all bought them this winter and I can’t imagine hiking without them. Sadly, they are pretty expensive too. I paid like $60 for mine at REI (or maybe $50? ), some friends spent less online (I didn’t have the time to wait for shipping). We tried cheaper ones from Amazon before that but they actually sucked. In this case, though expensive, the bigger brand name definitely meant better quality. Sometimes you really do get what you pay for! I’m grateful that I had the crampons on this trip. They’re not often necessary here in the Quad Cities area, so rental was the way to go for me. Anyway, I’m glad you’re getting around to reading these posts. I think you’ll really enjoy them. Well, I fully plan on going back and making the summit. I’ll let you know when, and you can come join us! I love the outdoor/adventure blogging community (and the blogging community in general). I’m constantly learning things, honing my craft, and just figuring stuff out.